Background In patients with prednisone-dependent asthma the dose of oral corticosteroids should be adjusted to the lowest possible level to reduce long-term adverse effects. However, the optimal strategy for tapering oral corticosteroids is unknown. Objective To investigate whether an internet-based management tool including home monitoring of symptoms, lung function and fraction of exhaled nitric oxide (FENO) facilitates tapering of oral corticosteroids and leads to reduction of corticosteroid consumption without worsening asthma control or asthma-related quality of life. Methods In a 6-month pragmatic randomised prospective multicentre study, 95 adults with prednisone-dependent asthma from six pulmonary outpatient clinics were allocated to two tapering strategies: according to conventional treatment (n=43) or guided by a novel internet-based monitoring system (internet strategy) (n=52). Primary outcomes were cumulative sparing of prednisone, asthma control and asthma-related quality of life. Secondary outcomes were forced expiratory volume in 1 s (FEV1), exacerbations, hospitalisations and patient's satisfaction with the tapering strategy. Results Median cumulative sparing of prednisone was 205 (25–75th percentile −221 to 777) mg in the internet strategy group compared with 0 (−497 to 282) mg in the conventional treatment group (p=0.02). Changes in prednisone dose (mixed effect regression model) from baseline were −4.79 mg/day and +1.59 mg/day, respectively (p<0.001). Asthma control, asthma-related quality of life, FEV1, exacerbations, hospitalisations and satisfaction with the strategy were not different between groups. Conclusions An internet-based management tool including home monitoring of symptoms, lung function and FENO in severe asthma is superior to conventional treatment in reducing total corticosteroid consumption without compromising asthma control or asthma-related quality of life. Clinical trial registration number Clinical trial registered with http://www.trialregister.nl (Netherlands Trial Register number 1146). Oral corticosteroids should be used in the lowest possible dose in patients with severe asthma to prevent adverse effects. We investigated whether an Internet-based management tool is superior to doctor's decision alone to reduce oral corticosteroid consumption. An internet-based management tool including home monitoring of symptoms, lung function and FENO in severe asthma leads to significant reduction in total oral corticosteroid consumption as compared to doctor's decision alone. This article provides a detailed description of the internet-based management tool that is not only ideal for use in clinical practice, but also suitable to assess outcome in clinical trials with novel anti-inflammatory steroid-sparing drugs. Comparative effectiveness research is increasingly applied in asthma to evaluate the outcome of clinical interventions.15 19 20 It provides the basis for rational decision-making about the care of individual patients with asthma and how best to deliver this care in real-world settings.21 We therefore designed this pragmatic randomised clinical trial to assess the outcome (cumulative dose of oral corticosteroids, asthma control and asthma-related quality of life) of an internet-based management tool in comparison with conventional asthma treatment over a period of 6 months. Eligible patients were adults (18–75 years) with a diagnosis of severe refractory asthma according to the major and minor criteria recommended by the American Thoracic Society.1 They had uncontrolled asthma despite intensive follow-up by an asthma specialist for at least 1 year, chronic treatment with oral corticosteroids and high doses of ICS plus long-acting bronchodilators. All were non-smokers with a maximum smoking history of 15 pack-years and had access to internet or mobile telephone. We conducted a 6-month pragmatic prospective randomised controlled study involving outpatients from two academic tertiary care hospitals and four large community hospitals in The Netherlands. The study was designed according to the CONSORT recommendations for pragmatic trials.22 Patients were randomly allocated to one of two strategies: dose adjustment of oral corticosteroids guided by an internet-based management tool (internet group) or according to conventional asthma treatment by the pulmonologist (conventional management group). All patients were followed for 6 months and had the same monthly follow-up visit at their own pulmonologist. Pulmonologists were instructed not to change the maintenance dose of ICS during the study unless strictly necessary on clinical grounds. The internet-based management tool comprised (1) an electronic diary; (2) treatment decision support for the patients; and (3) monitoring support by a study nurse. Patients recorded symptoms, registered their dose of oral corticosteroids, lung function using a hand-held spirometer (Piko-1; Ferraris Respiratory, Hertford, UK) and exhaled nitric oxide (FENO) using a hand-held NO analyser (Niox Mino; Aerocrine AB, Solna, Sweden) before medicine intake on a daily basis.23 Asthma control questionnaires (ACQ)24 were completed weekly and asthma-related quality of life questionnaires (AQLQ)25 were completed at baseline and every 3 months thereafter. Patients registered their data via a validated asthma monitoring service using an internet application or SMS messages.16 They also registered every event related to asthma such as antibiotic intake, emergency room visits or deterioration of symptoms. At the end of the study patients rated their global satisfaction with the tapering strategy on a 7-point scale ranging from ‘absolutely not satisfied’ to ‘completely satisfied’. Patients had daily information about their asthma graphically on the web page and received weekly instructions via the web page for stepwise corticosteroid dose adjustments according to a built-in algorithm (table 1). The decision rule of this algorithm was based on week-to-week changes in mean levels of FENO and ACQ as follows. If asthma remained controlled (change in ACQ <+0.5), the algorithm recommended down-titration by one dose step. If asthma control deteriorated, the algorithm recommended up-titration of the corticosteroid dose only in case of a concomitant increase in FENO >10 ppb; this was to avoid an increase in the dose of oral corticosteroids for reasons other than a flare-up of asthmatic airway inflammation.11 The steroid dose was decreased in case of ACQ >0.5 but FENO decreased by >10 ppb. In all other instances the algorithm recommended keeping the dose of corticosteroids unchanged. A study nurse was responsible for coaching the patients, monitoring the data entered at the web page and facilitating the communication between patients and pulmonologists. The pulmonologists were not aware of any of the data registered on the study website but were contacted by the study nurse in case of an imminent exacerbation (decrease in morning FEV1 of at least 10% compared with mean FEV1 from the week before). In case of an exacerbation they could overrule the internet dose prescription. The tapering algorithm was then interrupted and immediately restarted at the end of the steroid burst. Patients in the conventional management group visited the pulmonology outpatient clinic every month and had their oral corticosteroids down-titrated according to the prescription by the pulmonologist. Pulmonologists followed the Global Initiative for Asthma (GINA) guidelines for treatment of patients with severe asthma6 and were instructed to down-titrate the dose of oral corticosteroids whenever possible on clinical grounds. For research purposes the patients in the conventional management group were asked to enter their daily dose of corticosteroids in the study website and, for safety reasons, they also registered symptoms and lung function which were accessible to the study nurse only. Randomisation was stratified for study centre and initial oral corticosteroid dose (lower or higher than 10 mg prednisone equivalent/day). Patients were randomised by a computer random number generator and remained on the same allocation throughout the study. The treatment assignments were unblinded after randomisation to allow monthly corticosteroid dose adjustments according to conventional treatment by the physician or weekly adjustments according to the internet algorithm. The primary outcomes were cumulative sparing of oral corticosteroids (actual cumulative dose minus the expected cumulative dose) and (equivalence in) ACQ and AQLQ. Secondary outcomes were global satisfaction scale and (equivalence in) FEV1, number of exacerbations and days of hospitalisation. The actual cumulative dose was calculated from the doses registered daily on the website and the expected cumulative dose was extrapolated from the daily dose at study entry. An exacerbation was defined as a decrease in morning FEV1 of at least 10% compared with the mean FEV1 from the week before, or a respiratory event requiring an increase in prednisone equivalent to at least 10 mg/day, or a course of antibiotics, with or without hospitalisation. Newly diagnosed severe adverse effects of corticosteroid use during the study were documented for safety reasons. The sample size was based on demonstrating equivalence in asthma control between the two groups based on ACQ as the primary outcome measure. The minimal clinically important change in ACQ has been shown to be 0.5.24 A sample size of 50 patients per group was enough to detect a difference of 0.39 points or more in ACQ between the two groups (α=0.05 two-sided, β=0.20 one-sided). Data analysis using SPSS Version 15.0 was carried out according to a pre-established analysis plan and no interim analysis was done. Between-group comparisons of normally and non-normally distributed data were performed with the use of the Student t test and the Mann–Whitney U test, respectively. Repeated measurements of oral corticosteroid usage were analysed with mixed effects regression models including time, treatment strategy and their interaction as covariates, and with random patient effects for the intercept and the regression weight of time on oral corticosteroid treatment. The effect of time was modelled with a linear model and the goodness of fit was checked by introducing higher order polynomial terms of time into the model. The fit of the covariance structure of the residuals was checked by extending the model with an autoregressive structure. Histograms of the residuals were further inspected for normality. The main trend in the average change with time of the average corticosteroid usage was summarised with the change rate estimated from the linear model. The repeated measurements of the ACQ and AQLQ were analysed in a similar fashion but the dependent variables were the change from baseline ACQ and AQLQ, respectively. The effect of time on average change in ACQ and AQLQ was modelled non-parametrically and summarised with the change from baseline ACQ and AQLQ averaged over all repeated measurements during follow-up. Ninety-five patients were randomised from November 2007 to October 2008. Five patients in the conventional management group withdrew consent before the study had started and one patient was excluded from the study because of poor adherence to the trial protocol (figure 1). Eighty-nine patients were included in the intention-to-treat analysis (table 2); 51 and 38 patients were randomised to internet-based and conventional management, respectively. Randomisation was stratified without using allocation blocks, which explained the unequal number of patients in each study group. Assessment, randomisation and follow-up of the study patients. Randomisation was stratified but without blocking, which explains the unequal number of patients in each study group. The median dose of prednisone equivalent at study entry was 10 (25–75th percentile 5–15) mg/day in the internet group and 10 (5–15) mg/day in the conventional management group (p=0.26). Other baseline characteristics of the study groups were equally similar (table 2). The median cumulative sparing of prednisone equivalent in 6 months was 205 (25–75th percentile −221 to 777) mg in the internet group compared with 0 (−497 to 282) mg in the conventional management group (p=0.02, table 3). Mixed effects regression model analysis showed a total decrease in daily prednisone requirement from baseline of −4.79 mg/day (daily decrease of −0.019 (SE 0.0014) in the internet group compared with +1.59 mg/day (daily increase +0.001 (SE 0.0032)) in the conventional management group (p<0.001, figure 2). Ten of 51 patients in the internet group and none of the patients in the conventional management group (p=0.004) managed to taper their oral corticosteroid dose to 0 mg, with a mean (SD) duration of 79.7 (12.8) oral corticosteroid-free days over 6 months. Changes in maintenance dose of corticosteroids over 6 months. The figure shows the change in maintenance dose of prednisone from baseline in each study group over the course of 180 days. Closed and open circles represent the mean daily changes in prednisone equivalent in the internet group and conventional management group, respectively; lines represent the slope from the mixed effects regression model (p<0.001 for comparison between the two groups). Asthma control remained stable in both groups with a mean change in ACQ score of 0.26 (95% CI 0.07 to 0.45) and 0.12 (95% CI −0.12 to 0.36) in the internet group and conventional management groups, respectively (p=0.37). Similarly, changes in asthma-related quality of life did not differ between the study groups (table 3) with mean changes in the AQLQ score of −0.03 (95% CI −0.24 to 0.18) and 0.14 (95% CI −0.13 to 0.41) in the internet and conventional management groups, respectively (p=0.30). Changes in FEV1, number of asthma exacerbation, days of hospitalisation and patients' global satisfaction with the strategy were not different between the two groups (table 3). 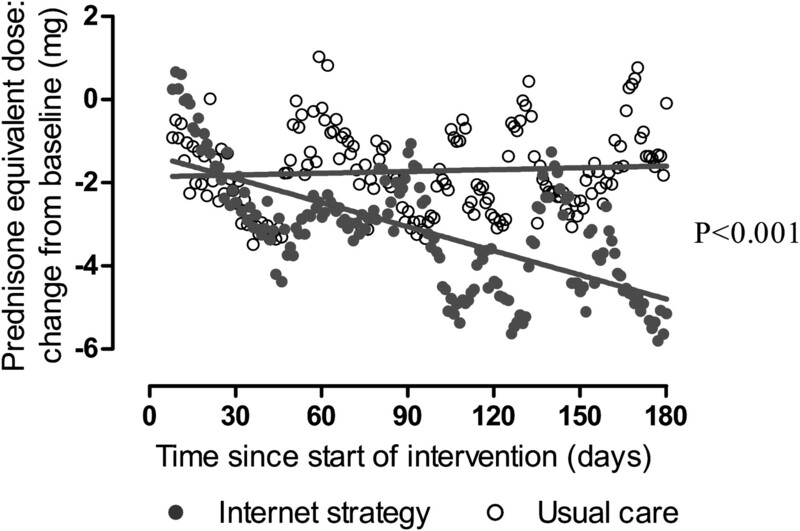 The median (range) change in dose of ICS was 125 (−250 to 250) μg/day in the conventional management group versus no change (0 to 250) μg/day in the internet strategy group (p<0.01). Three patients had newly diagnosed severe adverse effects (diabetes in two patients and glaucoma in one patient). Compliance with measuring FEV1, FENO, ACQ and entering the data into the website was very high (88.8% in the conventional treatment group, 89.6% in the internet strategy group and 89.3% in the whole group). The computer algorithm was overruled by the pulmonologist in 37 of 1023 decisions. The main reasons for these were to slow down the pace of steroid tapering (65%), to treat an exacerbation (9.7%) or to increase the oral corticosteroid dose based on clinical grounds (9%). On eight occasions the patients themselves decided not to follow the computer advice for a variety of reasons. ACQ and FENO contributed to the decisions of the computer algorithm in 859 (84%) and 164 (16%) cases, respectively (table 4). There was no difference in total sparing dose of oral corticosteroids between patients who had or had not FENO-related decisions by the algorithm (482.7±1223 mg vs 462.12±455 mg, p=0.83). This study shows that an internet-based management tool has the potential to decrease total corticosteroid consumption in patients with steroid-dependent asthma compared with conventional treatment over a period of 6 months without compromising asthma control or asthma-related quality of life. These results suggest that a strategy based on intensive internet monitoring of objective measures of asthma control should be considered as a safe and feasible way to adjust the dose of oral corticosteroids in patients with severe asthma. There is very little information available in the literature on how to taper oral corticosteroids safely in asthma after prolonged use. The adjustment of ICS guided by objective parameters of airway disease has been addressed in several other studies. The use of airway responsiveness,26 eosinophils in induced sputum27 and FENO28 29 appear to be superior over usual care in most studies, although for FENO there has been some controversy.30–32 In contrast to these previous studies, the aim of our study was not to evaluate the use of ACQ or FENO in adjusting the corticosteroid dose but to use these measures as part of an integrated multifaceted approach including internet-supported monitoring and continuous supervision by a specialised asthma nurse. We compared the effectiveness of two clinical strategies using a pragmatic approach19 according to CONSORT guidelines.22 In this approach the use of placebo or sham is not recommended to assess the relative benefits versus harms of different treatment strategies in order to make it more representative of actual practice.19 Patients in our study were aware of their randomisation group and knew that they would receive tapering instructions either on a weekly basis from the computer or by the treating physician on a monthly basis. Blinding the patients would therefore not only be futile but also diverge from the pragmatic concept. One could argue that belief in the novel internet approach, extra effort and optimism might have positively influenced the effectiveness of the internet-based management tool. However, given the fact that the patients' global satisfaction with both tapering strategies was similar and even tended to be in favour of conventional asthma treatment, this seems highly unlikely. The success of the internet-based strategy therefore does not seem to be biased by enthusiasm for the new intervention. The design of the tapering algorithm was such that stable symptoms (increase in ACQ <0.5) would always lead to a reduction in corticosteroid dose and increased symptoms (increase in ACQ ≥0.5) only to a step-up in dose if there was a concomitant increase in FENO. This was to avoid overtreatment in patients with corticosteroid withdrawal symptoms or discordance between symptom expression and inflammation.33 Post hoc analysis showed that weekly ACQ (with FEV1 included) was the major driver of the algorithm decision, suggesting that corticosteroid sparing could have occurred without daily measures of FENO. Whether daily FENO measurements have additional value in predicting exacerbations in these patients is as yet unknown. The use of internet-based therapies combined with novel technologies to assess disease severity will become more common in future healthcare.13–17 Such technologies may allow centralised continuous long distance support of patients, improve the quality of care and reduce the time and efforts required for intensive monitoring processes such as tapering of oral corticosteroids. The implementation of internet-based management tools in real life would therefore increase patient safety and improve the communication between patients and caregivers. In conclusion, we have shown that, in patients with severe prednisone-dependent asthma, oral corticosteroids can be successfully titrated by the use of an internet-based management tool. The internet-based strategy is feasible for almost all patients, and is ideal for use in clinical practice and is also a suitable tool for assessing outcome in clinical trials of novel anti-inflammatory steroid-sparing drugs.34 35 In fact, this personalised medicine approach might be one of the first examples of how patients with severe respiratory chronic diseases might benefit from interactive internet-based treatment strategies. The authors thank Petra Hirmann, MarijkeAmelink, Paul van Spiegel, Christian Melissant, Lous Rijssenbeek, Renske van der Meer, Bita Hajian, Michael van Hengstum, the lung function departments of the Academic Medical Centre Amsterdam, Medical Center Leeuwarden, HagaZiekenhuis, Medisch Spectrum Twente, Leiden University Medical Center, St Franciscus Gasthuis and all participating patients. American Thoracic Society. Proceedings of the ATS workshop on refractory asthma: current understanding, recommendations, and unanswered questions. Am J Respir Crit Care Med 2000;162:2341–51.
. Difficult/therapy-resistant asthma: the needfor an integrated approach to define clinical phenotypes, evaluate risk factors, understand pathophysiology and find novel therapies. ERS Task Force on Difficult/Therapy-Resistant Asthma. European Respiratory Society. Eur Respir J 1999;13:1198–208.
. Adverse effects of oral corticosteroids in relation to dose in patients with lung disease. Thorax 2001;56:279–84.
. Dose-related patterns of glucocorticoid-induced side effects. Ann Rheum Dis 2009;68:1119–24.
. Characterization of the severe asthma phenotype by the National Heart, Lung, and Blood Institute's Severe Asthma Research Program. J Allergy Clin Immunol 2007;119:405–13. National Institutes of Health. National Heart, Lung, and Blood Institute. GlobalInitiative for Asthma. Global strategy for asthma management and prevention. NHLBI/WHO Workshop Report 2008. http://www.ginasthma.org/ (accessed Oct 2010).
. Refractory asthma. Med Clin North Am 2002;86:1073–90.
. Predictors of therapy resistant asthma: outcome of a systematic evaluation protocol. Thorax 2003;58:561–6.
. Update on glucocorticoid action and resistance. J Allergy Clin Immunol 2006;117:522–43.
. The natural history of asthma in adults: the problem of irreversibility. J Allergy Clin Immunol 1999;103:539–47.
. On the various forms of corticosteroid withdrawal syndrome. Am J Med 1980;68:224–30.
. Effects of a mobile phone short message service on antiretroviral treatment adherence in Kenya (WelTel Kenya1): a randomised trial. Lancet 2010;376:1838–45.
. Individualized electronic decision support and reminders to improve diabetes care in the community: COMPETE II randomized trial. CMAJ 2009;181:37–44.
. Telemonitoring and self-management in the control of hypertension (TASMINH2): a randomised controlled trial. Lancet 2010;376:163–72.
. Internet-based monitoring of asthma: a long-term, randomized clinical study of 300 asthmatic subjects. J Allergy Clin Immunol 2005;115:1137–42.
. Internet-based self-management plus education compared with usual care in asthma: a randomized trial. Ann Intern Med 2009;151:110–20.
. Internet-based home monitoring of pulmonary function after lung transplantation. Am J Respir Crit Care Med 2002;165:694–7.
. The Aerocrine exhaled nitric oxide monitoring system NIOX is cleared by the US Food and Drug Administration for monitoring therapy in asthma. J Allergy Clin Immunol 2004;114:1241–56.
. A call for action: comparative effectiveness research in asthma. J Allergy Clin Immunol 2010;127:123–7.
. The Coping with Asthma Study: a randomised controlled trial of a home based, nurse led psycho educational intervention for adults at risk of adverse asthma outcomes. Thorax 2005;60:1003–11.
. Rethinking pragmatic randomised controlled trials: introducing the “cohort multiple randomised controlled trial” design. BMJ 2010;340:c1066.
. Improving the reporting of pragmatic trials: an extension of the CONSORT statement. BMJ 2008;337:a2390. American Thoracic Society. ATS/ERS recommendations for standardized procedures for the online and offline measurement of exhaled lower respiratory nitric oxide and nasal nitric oxide. Am J Respir Crit Care Med 2005;171:912–30.
. Measurement properties and interpretation of three shortened versions of the asthma control questionnaire. Respir Med 2005;99:553–8.
. Determining a minimal important change in a disease-specific Quality of Life Questionnaire. J Clin Epidemiol 1994;47:81–7.
. Clinical control and histopathologic outcome of asthma when using airway hyperresponsiveness as an additional guide to long-term treatment. Am J Respir Crit Care Med 1999;159:1043–51.
. Asthma exacerbations and sputum eosinophil counts: a randomized controlled trial. 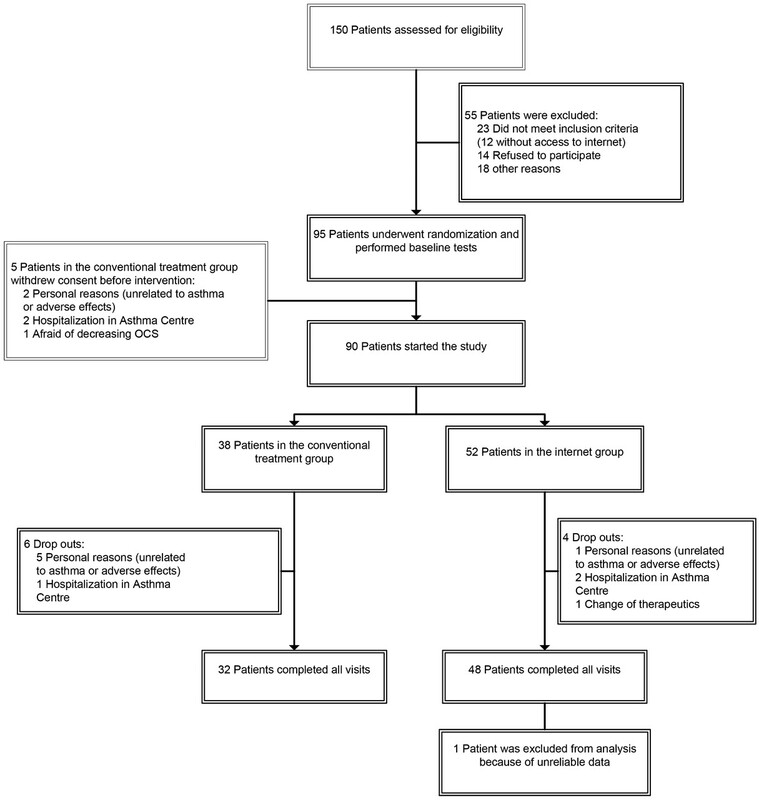 Lancet 2002;360:1715–21.
. Titrating steroids on exhaled nitric oxide in children with asthma: a randomized controlled trial. Am J Respir Crit Care Med 2005;172:831–6.
. Use of exhaled nitric oxide measurements to guide treatment in chronic asthma. N Engl J Med 2005;352:2163–73.
. Exhaled nitric oxide in pulmonary diseases: a comprehensive review. Chest 2010;138:682–92.
. A systematic review and meta-analysis: tailoring asthma treatment on eosinophilic markers (exhaled nitric oxide or sputum eosinophils). Thorax Published Online First: 11 October 2010. doi:10.1136/thx.2010.135574.
. Management of asthma based on exhaled nitric oxide in addition to guideline-based treatment for inner-city adolescents and young adults: a randomized controlled trial. Lancet 2008;372:1065–72.
. Cluster analysis and clinical asthma phenotypes. Am J Respir Crit Care Med 2008;178:218–24.
. Mepolizumab and exacerbations of refractory eosinophilic asthma. N Engl J Med 2009;360:973–84.
. Mepolizumab for prednisone-dependent asthma with sputum eosinophilia. N Engl J Med 2009;360:985–93. Funding This study was funded by The Netherlands Organization for Health Research and Development (ZonMw). Equipment for the analysis of nitric oxide was provided by Aerocrine-AB in April 2007. The funding sources had no role in the study design, data collection, analysis or interpretation, or in the decision to submit this article for publication. Patient consent All patients provided written informed consent. Ethics approval The study was approved by the ethics committee of all participating institutions (Academic Medical Centre, University of Amsterdam, Amsterdam; Medical Center Leeuwarden, Leeuwarden; HagaZiekenhuis, Den Haag; Medisch Spectrum Twente, Enschede; Leiden University Medical Center, Leiden; St Franciscus Gasthuis, Rotterdam, The Netherlands).